Bath towel There are 14 products. Shower towel or Bath towel 65x125 cm Plain royal 100% combed terry cotton 540 gr/m². Soft and supple bath towel with a very good absorption and quick drying. Shower sheet 70x140cm 100% cotton terry multicolored green, fushia pink, orange, blue, green, mauve, burgundy and turquoise lines double sided. Shower sheet 70x140cm 100% cotton terry multicolored gray, beige, grey, white and black lines double sided. 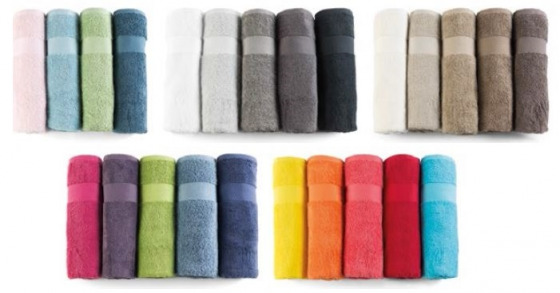 Shower towel 70x140 cm 100% cotton terry combed from Egypt 660 gr/m². Soft and absorbent shower towel. 5 cm double hand-made and positioned at the bottom of the shower towel. Crown embroidered on the right, just above the braid. Available in 20 colors. 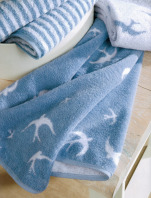 Shower sheet 70x140 cm 100% cotton terry blue and white swallows, double sided. Bath towel 70x140 cm 100% combed cotton terry Egyptian terry long fibers, 700gr/m², very soft and very large capacity of absoption thanks to double cotton twist yarns. Machine washable at 60°C. Shower towel 70x130 cm, 100% pure combed plain towelling cotton, 560gr/m². Available in 30 colors. Bath towel 65x125 cm 100% combed cotton 530 gr/m². Soft bath towel, soft and with very good absorption. Colors: white, chalk, beige, brown, pink, gray, black, sky blue, ocean, navy, turquoise, coral, mandarin orange, red, emerald green. Guest towel 40x60 cm, towel 50x100 cm and shower sheet 70x140 cm Maiori Bassetti 100% cotton terry jacquard yarn dyed, 550 gr/m². Available in colors v1 rosso or v3 blu.